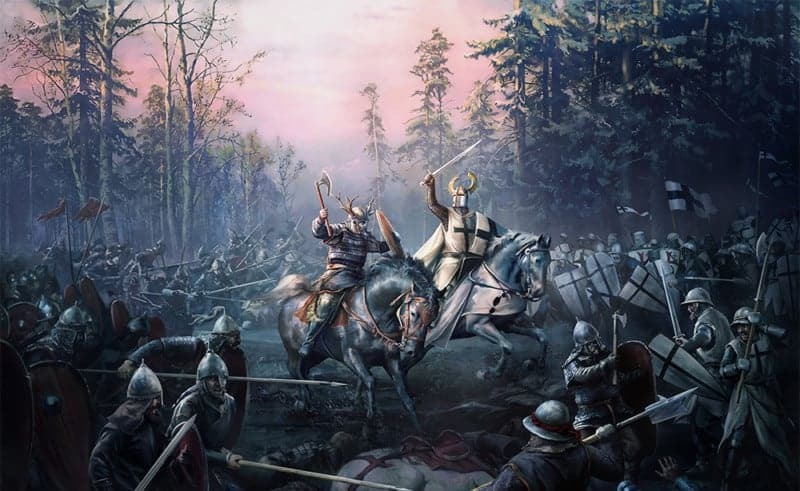 On November 13th, CRUSADER KINGS II (CK2), the medieval grand strategy game by Paradox Interactive, received its unprecedented thirteenth major expansion: HOLY FURY. 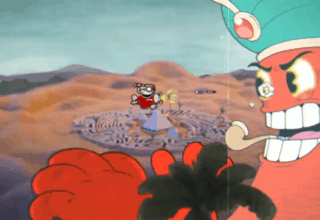 Billed as the nearly seven-year-old game’s biggest expansion yet, it certainly is a contender for that title. 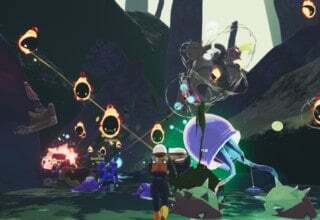 According to one of the developers, it has been in the works for a full year to boot! 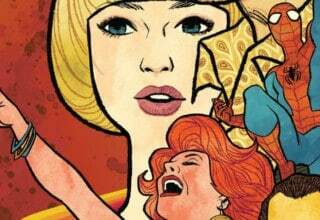 Jam-packed with features and content, it is hard to describe the sheer scope of this expansion. And, as always, you will receive plenty of content in the free update even if you do not purchase HOLY FURY. This review will attempt to unpack all of this content and determine if HOLY FURY is worth your money. Where to begin with HOLY FURY? It is difficult to know where to start unpacking this expansion as there is so much content! 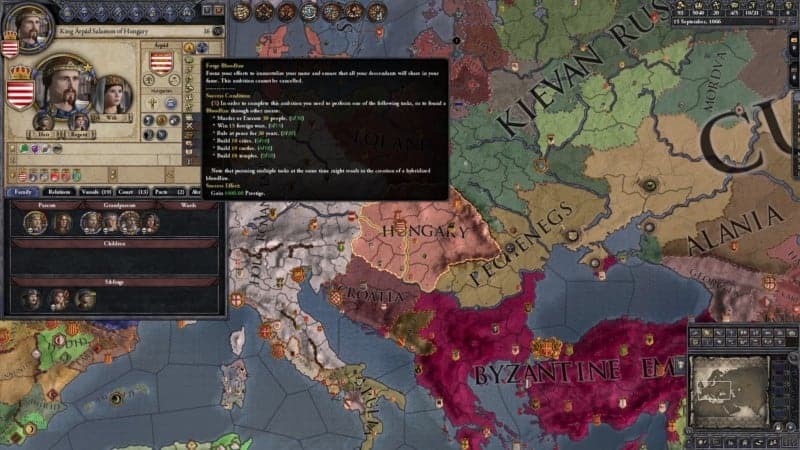 The above video by CRUSADER KINGS II game designer Alexander “rageair” Olther scratches the surface of what HOLY FURY entails, both in the expansion and in the free update. I suppose I should start with what the expansion is about. Previous CRUSADER KINGS II expansions have usually had a “theme” or “focus” so to speak. For example, SWORD OF ISLAM focused on Muslims. WAY OF LIFE had a theme of things to do to liven up character interactions. HORSE LORDS focused on the nomads of the steppe. And so on. For HOLY FURY, the focus is a bit split. However, as one can probably tell from the name of the expansion, religion and holy warfare play a central role. Particularly, the expansion focuses on pagans in addition to giving some love to Catholics, who were originally the only playable faction in the game. And thus, in a sense, are the “default” CK2 faction. That is what I mean when I say the game is going back to the basics! 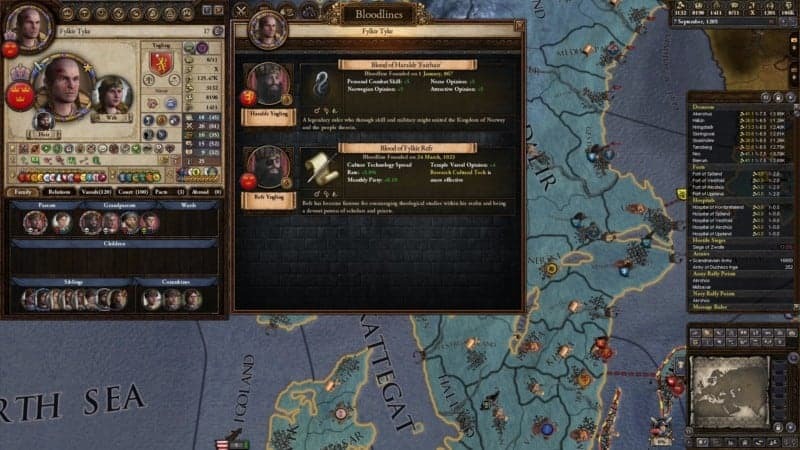 I suppose that, in order to determine if HOLY FURY is worth your money, or whether you should wait for a sale or even give it a pass entirely, it is best to find out what it is you are actually paying for. 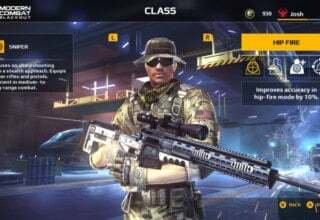 Thus, this review will dissect what is a paid feature and what you will get in the free update. First, we shall examine the paid features of this expansion. One of the flagship features of HOLY FURY is Dynamic Pagan Reformation. Playing as pagans (such as Norse pagans, Baltic pagans, Tengri Pagans, and so on) has been possible ever since THE OLD GODS expansion way back in 2013. A central aspect of playing pagans is that one must eventually make a choice. Staying true to the old ways will eventually become untenable. 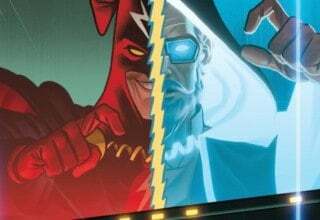 So, one must either convert to an organized religion such as Christianity or Islam… or reform their pagan faith into its own organized religion. This mechanic has been in place ever since the aforementioned THE OLD GODS expansion. However, it has always been rather static. Much of the pagan religions were not well differentiated (particularly the “defensive pagans”). All pagan religions would get a religious head, holy wars, a Crusade/Jihad analogue, increased stability, and so on. With a few exceptions, they all felt rather samey, with only the Norse (and, to a lesser extent, Tengri) feeling truly unique and fleshed out. With HOLY FURY, that is the case no longer! In HOLY FURY, when you reform your religion as a pagan, you can now mold the faith in your image. You can shape it however you wish. Do you want to play a peaceful, syncretic, harmonious religion? You can do that. Do you want to play as warmongering holy warriors who wish to bring everyone into the one true faith? You can do that and everything in between! Whether you prefer to role-play in your playstyle or you are a powergaming achievement hunter, there will be a suitable combination for you! As one can see two screenshots up, there are three categories when you are reforming. First, there is Nature. This determines whether your religion is peaceful, proselytizing, warmongering, syncretic, and so on. You also select two Doctrines. These doctrines are special features that unlock various mechanics, often those of other organized religions such as Christianity, Islam, and the Indian faiths. You can implement the monasticism of Christianity, the Infidel tax of Islam, or both! 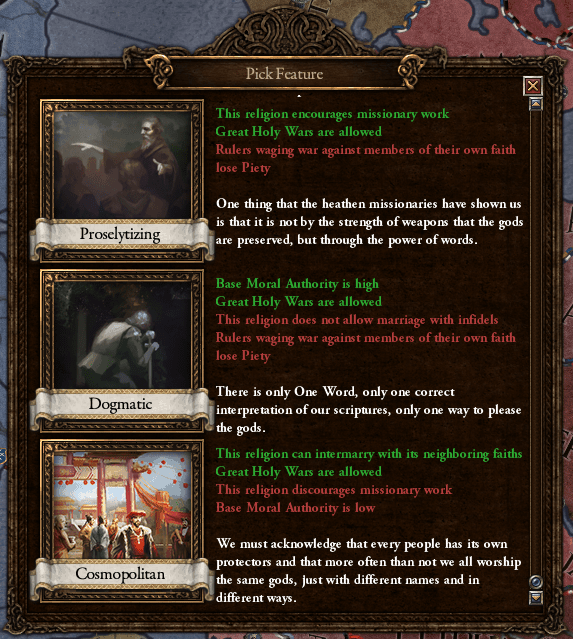 You can mix and match doctrines into hundreds of combinations, and each pagan faith also has a special exclusive doctrine. Finally, there is the leadership of your new religion. You can have your religion have a religious head similar to the Catholic Pope. You can become the religious head yourself, similar to an Islamic Caliph. Or you can have no religious head at all, like the Eastern religions such as Hinduism and Taoism. Each one has its own benefits and drawbacks! A full list of the options can be viewed here. Another new feature in HOLY FURY is the addition of Warrior Lodge Societies. Those of you who have played the brilliant mod Ascent of the Hrafn by Steam user Robkenyon may find this familiar. 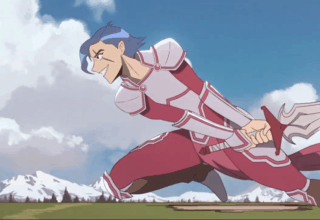 In that mod, the Champions of Midgard were a society of Norse warriors from all over the map, who would duel each other to prove who was the strongest Viking of them all. Warrior Lodges are, by and large, very similar in concept. Only this time, the Norse don’t get to have all the fun! Each pagan faith gets its own Warrior Lodge, with its own name and various differences for flavor. As someone who loved the aforementioned mod, it was great to see a similar concept integrated into an official expansion. They are fun! This is another feature of HOLY FURY that may seem familiar to those of you who use mods. 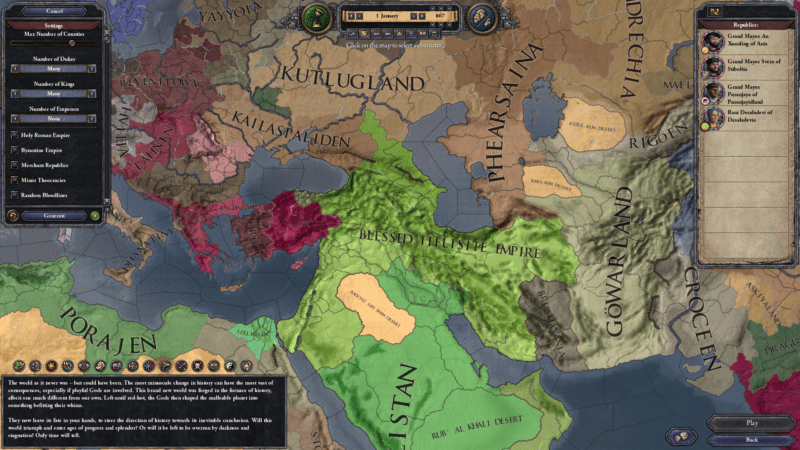 There are quite a few mods on the Steam workshop which add bloodlines to the game. 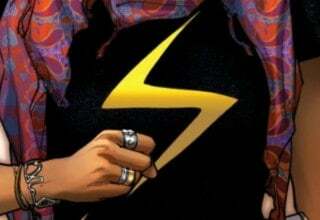 However, those mostly manifest as static traits and are not particularly interactive or customizable. This feature changes that, while making the concept of bloodlines official! 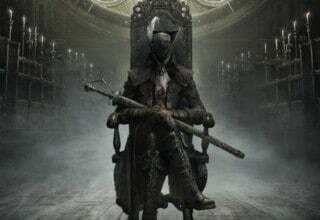 Firstly, there are multitudes of historical bloodlines that are present from the start in the game. They derive from all kinds of historical figures both in-game and before the period covered. These figures include Charlemagne, Attila the Hun, Genghis Khan, and, as in the screenshot above, Haraldr Fairhair, the first king of Norway. Each one provides unique bonuses, and there’s plenty of them to collect! Some players may collect bloodlines like Pokemon! I’ll Leave my Own Mark on History! But if the historical bloodlines aren’t enough to sate your, ahem, bloodlust, Paradox has you covered! Under certain specific conditions, your character will be able to forge their own bloodline, which will flow through the veins of their descendants. Once you do, the bonuses that it will give will depend on how it was done. For example, a murderous bloodline will give bonuses to intrigue. In the second screenshot above, the Bloodline of Fylkir Refr, which was forged via an event that focused on theology, is an example of a custom bloodline. 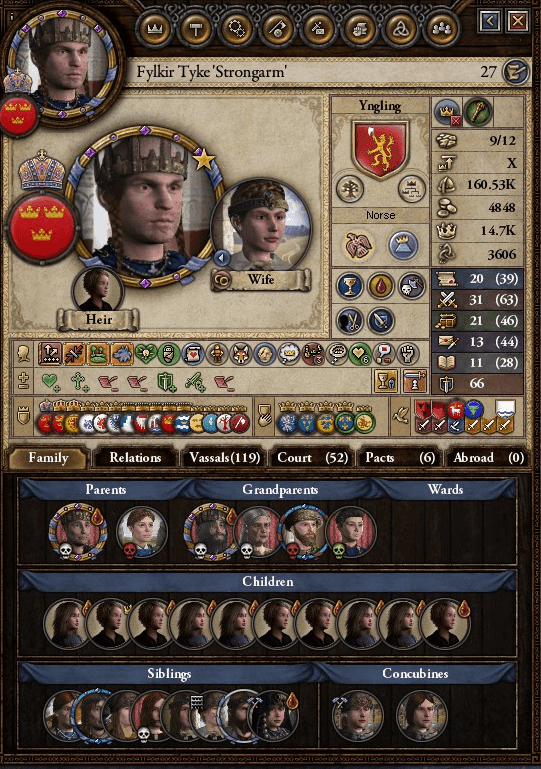 There are many different kinds of custom bloodlines that you can forge, allowing you to leave your dynasty’s mark on history. A list of possible bloodlines can be viewed on the wiki here. Now we’re getting back to the basics Christian-exclusive feature (though some Pagan reformation doctrines allow something similar). That feature is Sainthood. This feature was in the original CRUSADER KINGS, but for various reasons was not included in CRUSADER KINGS II, despite the fans clamoring for it to be brought back. Until now! With HOLY FURY, this feature makes a long-awaited return! With this feature, pious Christian characters have the opportunity to become saints after their death. The Pope/Patriarch/a local bishop may decide to beatify them (one of the steps to canonization, or becoming a saint officially). After that, there is a chance he may decide to canonize them. This is a great, flavorful addition to the game, but it also has a gameplay effect! 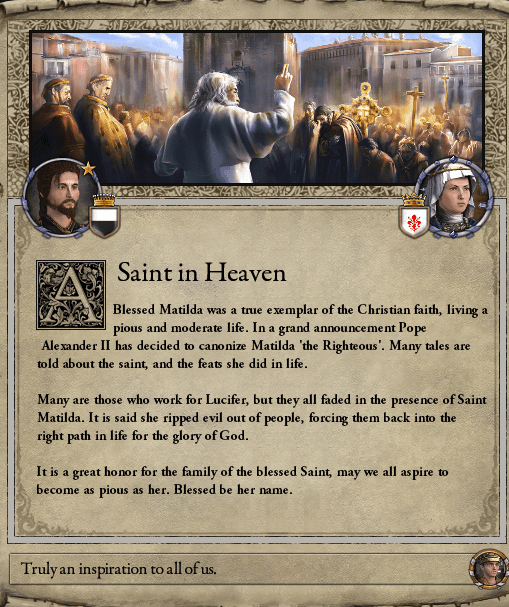 Members of the saint’s dynasty will gain great prestige, and the descendants of the saint will also get a special bloodline. Considering the importance of religion and saints in the period of the Middle Ages depicted in the game, this is definitely a welcome addition. No, that isn’t just the title of a badass song from the game. This is another feature of the DLC which is going back to the basics! 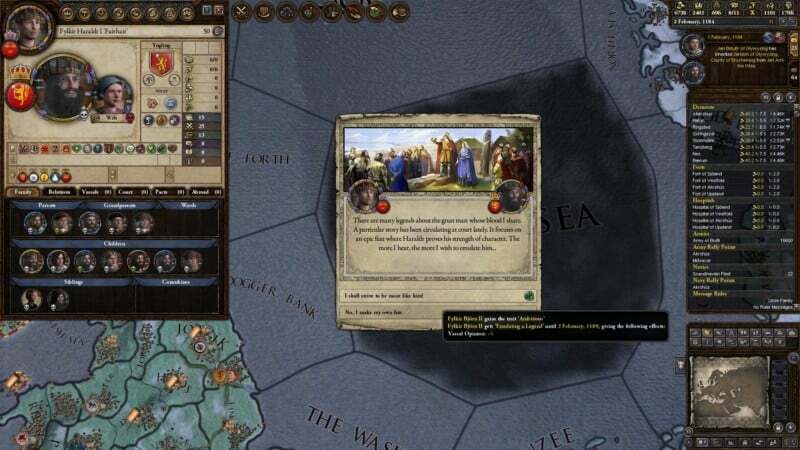 Yes, HOLY FURY adds coronation ceremonies for feudal Catholics to the game. For feudal Catholic rulers, simply earning the title of King or Emperor is no longer a matter of simply gaining the title. No, in order for the world to recognize them as a legitimate ruler, they must find a member of the clergy to coronate them. For all power ultimately derives from God! In fact, not having a proper coronation will lead to escalating penalties, as your subjects will not see you as legitimate. 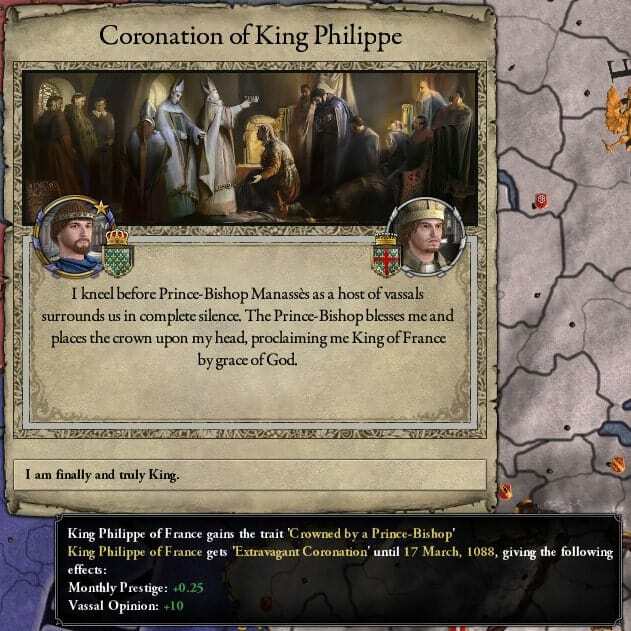 You can settle for being crowned by a local bishop, but if you want to show off your splendor, you can have a more powerful clergy member be the one to coronate you. Those who can afford to go all out can even request the Pope himself to be the one to crown them, though it won’t be cheap. It is a lovely addition that adds both flavor and historical realism to the game. One of the biggest features of HOLY FURY is one which completely changes the game’s setup. This comes in two flavors. First, Shattered World, which breaks up the world into its constituent Counties and/or Duchies. The more radical of the two is Random World, which changes everything. Random governments, religions, cultures, you name it! What the game comes up with when it shatters/randomizes the world is fully customizable, and offers practically limitless possibilities. While there have been some mods that shatter the world, they don’t even come close to this. Suffice to say, if you ever get bored of the historical setup, HOLY FURY has you covered! There are much more paid features than are listed in this article, too! I could write about them all week! That’s a lot of paid features! But you may be asking, if you cannot purchase HOLY FURY immediately, what will this update do for you? Worry not. As always, there are goodies galore in the free patch accompanying HOLY FURY, even if you do not purchase the expansion. The Character View is revamped (pictured above), to make information and diplomatic actions more transparent and accessible. Another example is the wide array of map improvements. Many regions are given a thorough rework in their setup. It adds far more depth to regions that were previously lacking in it, and makes the map look nicer and more fleshed out. Speaking of, that brings us to one of the most important free additions: a solution to ugly borders! Paradox have added a Game Rule that makes it so that exclaves will become independent on succession. No more French exclaves in Iraq! The strictness of this rule is changeable at game start. An example can be viewed here. The best part? It is completely free! New succession laws are introduced, and some are improved! Elective successions are no longer completely opaque. Paradox has made the AI logic for electors transparent and visible to the player, making it far more viable. Not only that, but new exclusive elective succession laws for the Holy Roman Empire, and the Byzantine/Roman Empire, are also added to the game. One free addition deserves special mention: reworked Catholic crusades! 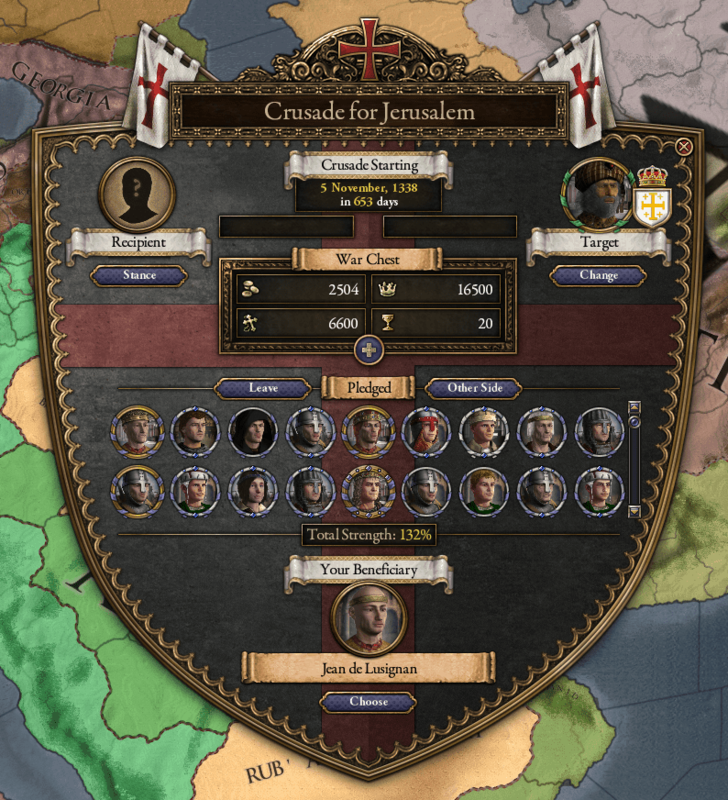 Yes, Paradox is putting the “Crusader” back in CRUSADER KINGS! Possibly the best example in the patch of going back to the basics. Rather than the generic system of ages past, this is unique to Catholics. There is a preparation phase before the Crusade begins in earnest, where rulers pledge both money and troops towards the Crusade. You can also select a “beneficiary”, who can gain positions or even rulership in the resulting crusader state if the Crusade is victorious. Speaking of crusader states, with this system they become independent of any ruler, made up of the beneficiaries of the participants. They are actually crusader states, rather than the ahistorical and silly crusader colonies of versions past. It allows for deeper, more refined crusades, the eponymous holy wars that defined the era depicted in the game. So, after listening to me yammer on about HOLY FURY for Odin knows how long, you are probably wondering whether or not you should buy the expansion. Paradox are billing HOLY FURY as the game’s biggest expansion yet. And it deserves that title! 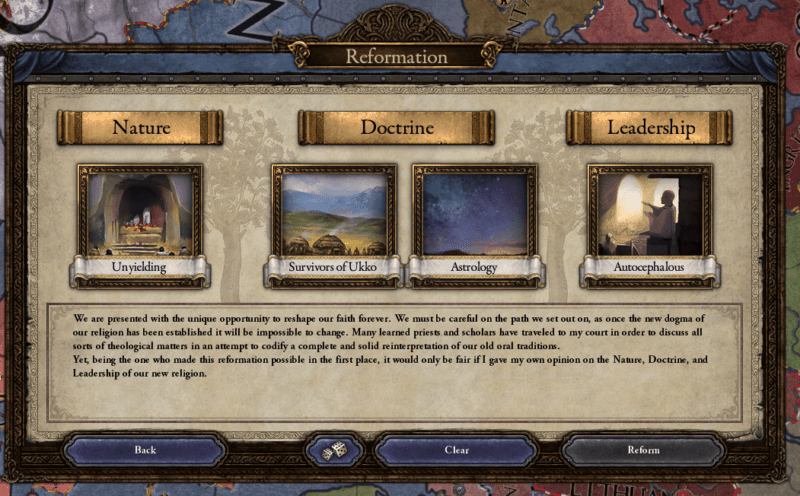 I have been a Paradox fan since I first played EUROPA UNIVERSALIS III in 2010, and in that near-decade I have not seen an expansion as packed with good content as HOLY FURY. While Pagans and Christians get the bulk of the goodies, it will add a great deal to the game regardless of whom you play as. At twenty dollars, it’s an expensive DLC, but honestly? I found it to be worth every penny. 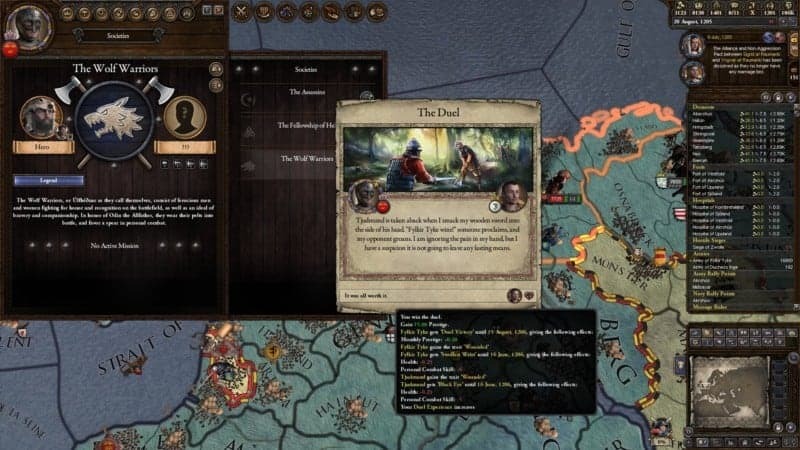 HOLY FURY may be the last or penultimate expansion for CRUSADER KINGS II. If this is indeed the last one, CRUSADER KINGS II is certainly going out with a bang!